​House of Ruff’s climate-controlled indoor park is where dogs and their owners can exercise and socialize in any type of weather. Say goodbye to those muddy, damp days outside! The AC is perfect for those hot days. 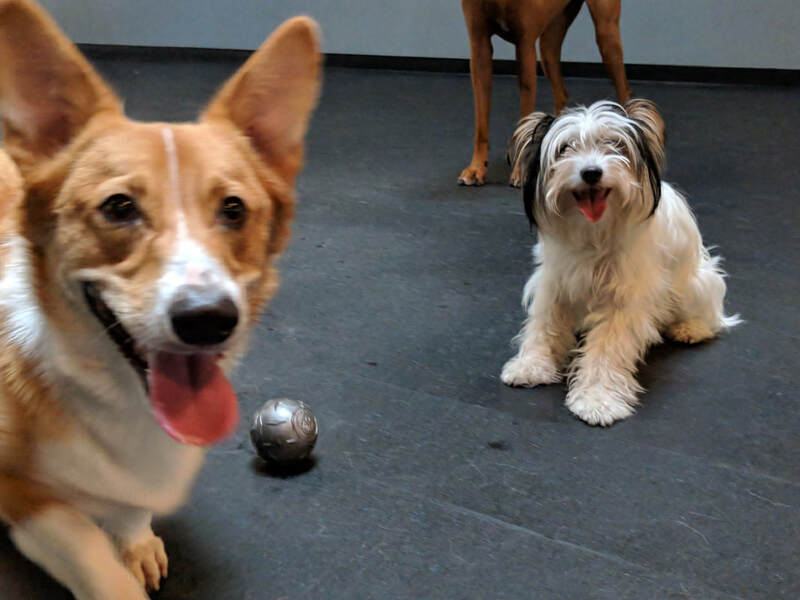 The Indoor park is a bright, warm space where members can play ball and enjoy the company of other dogs. All play areas are covered with high-quality recycled rubber matting which provides a safe and comfortable environment to exercise your dog. Our matting is considered the “filet mignon” of the recycled rubber industry, proudly saving 1,412 tires from landfills. We thoroughly clean the floor with biodegradable products every night. After hours private park rentals can be used for a place to practice your new puppy training ,dogs that are reactive, agility practice or just 30 minutes of the entire park to yourselves!! You get to chose! We offer spots on Saturday and Sunday evenings only. Call today to reserve a spot. FAQ: Do I have to be a member to use the park? We require dogs using the Social Members Indoor Dog Park hours pass a behavioral assessment prior to their first visit. After their assessment is passed they will become members allowing them to use all our services. Dogs using the after hour private park time slots do not need to be members. They will not require a behavioral test but with out one they will not be allowed to use all of our other services just the private space rental. You must sign a waiver, leave a credit card on file for any damage, provide proof of vaccinations and the dog(s) must be on a leash and under close control until they are in the fenced in play area. If your dog is reactive we need to know so we can make special arrangements bringing you into our play areas. Please let the front desk know when you call to make an appointment. Where will my dog pee? Members using the Indoor Dog park have access to an outside fenced in area for the dogs to relieve themselves as well as a large 8' x 30' Indoor K-9 grass potty patch with a unique backing that allows for immediate drainage of liquid waste. We disinfect and hose the area frequently throughout the day to ensure cleanliness. A Ruff team member greets every owner and dog as they arrive, confirms their club membership, dog's health and temperament requirements. All dogs over the age of 6 months must be spayed or neutered in order to become a member. To ensure your dog meets membership requirements, ​please review ﻿Park Rules & Policies﻿, then call to schedule your Meet & Greet before arriving at the club. The Meet & Greet process involves a behavioral assessment of how your dog responds to and socializes with humans and other dogs.